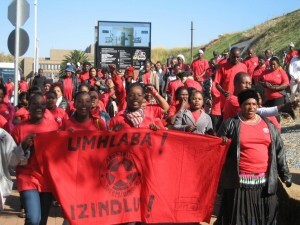 The Anti-Imperialist South Africa: A revolution betrayed? The South African revolution is often seen as one of the most historic events of the twentieth century, a national struggle based on an international network of solidarity that cut across racial, national and class boundaries. However, the neoliberal economic agenda pursued by the ANC has been enforcing measures that contradict the very principles of its Freedom Charter. Ceasefire Associate Editor Adam Elliott-Cooper looks at how a revolution is losing its way. The South African revolution is often seen as one of the most historic events of the twentieth century. Ending apartheid was a national struggle based on an international network of solidarity that cut across racial, national and class boundaries. However, not only did political structures change, but economic ones too. 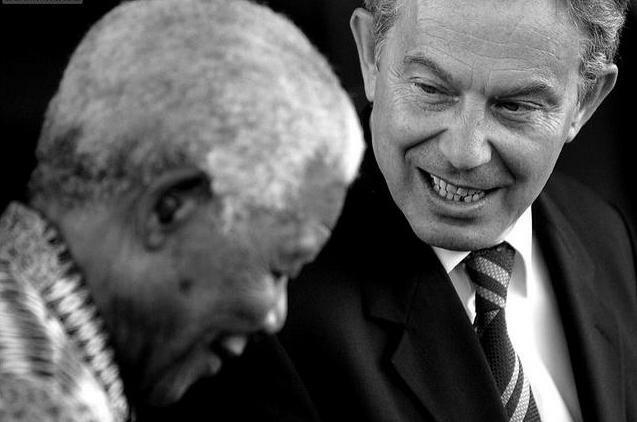 The neoliberal agenda pursued by the ANC in response to international pressure resulted in widespread privatisation, relaxations of labour laws and liberalisation of finance, all measures that contradict the ANC’s Freedom Charter, which Mandela promised to adhere to following his release from prison in 1990. These reforms have resulted in widespread unemployment, lack of basic services such as water as well as spread of disease. However, the rich history of political resistance in South Africa is far from dead. New forms of organisation and activism are springing up demanding the rights and freedoms that so many South Africans have struggled and fought to attain. “Nationalisation of the mines, banks and monopoly industry is the policy of the ANC, and a change or modification of our views in this regard is inconceivable” were the triumphant words of Nelson Mandela in his first public address after being released from prison in 1990. For a year Mandela emitted similar rhetoric, and in response, the Johannesburg Stock Exchange plummeted. At a meeting with international bankers and industrialists, Mandela stated that he simply wished to mimic the state-led industry used to rebuild Britain, Germany and Japan after World War II. He was told by the Dutch minister of industry that “the economies of the world are [now] interdependent… No economy can develop separately from the economies of other countries”. They argued that since some countries are more efficient at producing some products or services than others, the most efficient economy will import what other countries are better at producing and export what it is most efficient at producing, creating maximum efficiency and maximum prosperity for all. Thus, like many other world leaders, Mandela soon conceded that giving in to globalisation was the only option for moving forward. The ANC introduced GEAR (Growth, Employment & Redistribution), the structural adjustment programme that included privatisation of non-essential state-owned corporations, wage restraints by organised labour, flexibility in the labour market, lower inflation, trade liberalisation and the removal of most tariffs. An $850 million IMF deal as well as the signing of GATT (General Agreement on Tariffs & Trade) during the ANC – apartheid government negotiations, meant that raising the minimum wage was illegal and made hiring and firing far easier for employers. This has resulted in many African business people becoming very rich, very quickly. In 2007, South Africa’s economy created 5,073 new dollar millionaires, bringing the total to 48,500, many of whom were Black Africans who did not have access to the market under apartheid – the social implications of this were a new black economic elite in South Africa. The privatisation that took place resulted in huge job cuts. Telkom shed one third of its workforce when it became privatised. In fact, formal manufacturing jobs fell by 0.4 million after GEAR was implemented; for example, SunAir airline went bankrupt after it was privatised, resulting in even more job losses. When a nationalised industry is sold, it goes into the hands of private companies, who are accountable mainly to shareholders. In fact, it could be argued that large companies are structured in a similar way to imperial regimes, which are authoritarian, with very little accountability. This line of argument sees large corporations as profit-maximising private tyrannies that put financial gains before those of the public interest and the environment. Multinational companies, many from the United States and Europe, tend not to invest money back into the country where they are operating, a practice repeated in South Africa. This lack of accountability has also resulted in poor customer service, despite many of these companies reaping record profits. Three quarters of Telkom’s phonelines were disconnected in its first three years due to customers not being able to afford the bills. The privatised electricity company Eskom increased prices by 25% causing widespread disconnections. Shockingly, international companies given contracts to provide clean water cut off the water supply to people who could not afford the newly increased tariffs. People were forced to use the water from local rivers resulting in an outbreak in cholera. Of course, liberalisation of finance means that capital flight can dictate economic policy. This makes the economy highly volatile, leading to financial crises and reduced growth in the long run. Mandela once mentioned nationalisation at a private meeting and as a result the All-Gold Index plunged by 5 per cent. This once again is highly undemocratic. Furthermore, curbing the power and influence of trade unions also limits democratic participation, and creating a more flexible labour market often leads to worker exploitation and job losses. In South Africa, labour market flexibility has led to unemployment doubling to 48% in the ten years leading up to 2002. The only rise in employment has been in the informal sector. Furthermore, South Africa has seen a rise in the working poor – people working but living below the poverty line, from about nine thousand nine thousand to two million since the implementation of GEAR. This enormous rise in unemployment has led to increased poverty. 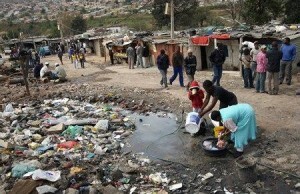 Twenty-two million South Africans live in abject poverty with 4 million living on less than $1 a day. Some of those marginalised in employment and education, as well as in access to basic services, have chosen to organise themselves outside of formal state and market structures. Movements representing the interests of shack-dwellers, such as Abahlali baseMjondolo, have been fighting for the land rights of the thousands of slum residents who are being evicted from their homes due to land privatisation. Direct action such as land occupation as well as popular demonstrations are the most common forms of resistance. Many of these new civic movements align themselves with the ‘anti-globalisation’ movement, with links to similar groups in Brazil, Philippines and India. The Concerned Citizens Forum (CCF) has trained “struggle plumbers and electricians” who reconnect electricity and water to homes that have had their supplies cut off by the private companies who have increased their prices. Other groups have taken up cudgels on behalf of families who cannot pay their children’s school fees. The cutting-off of water and electricity by private companies more concerned with profits than service provision has also been addressed by grass-roots social movements; for example the Anti-Privatisation Forum (APF), which favours direct action rather than traditional appeals to government, stating that they are trying to build a new left outside of the ANC alliance, speaking on basic issues like water, electricity, jobs and housing. The Treatment Action Campaign (TAC) uses a mixture of civil disobedience, protest and court action to force government and international drug companies to provide medical care for HIV/AIDS sufferers, whose slogan is “Smash GEAR – Celebrate life”. The transition to ANC rule has led to steady economic growth in South Africa, an attribute which few of Africa’s economies boast. It has allowed Black as well as white South Africans become successful entrepreneurs by allowing private enterprise to benefit from many of the opportunities a free market has to offer. However, the inefficiency of private companies to provide basic services to all of South Africa’s citizens goes a long way in tarnishing its legitimacy. Furthermore, the argument that unemployment and poverty will be cut when efficient private industries grow large enough to employ a larger workforce becomes increasingly unconvincing as South Africa reaches its fifteenth post-apartheid year – and the situation is worsening rather than improving. However, the increased profits to private companies and the creation of a Black economic elite in South Africa simply concentrated wealth in a small minority, leaving the majority of South Africa’s population in poverty. Problems of unemployment have not been solved by the ANC’s economic policies, neither have the issues surrounding access to services such as decent housing, health and education. If it were the responsibility of the state to provide these services, then the electorate would be in a position to hold them accountable if they did not deliver. Instead, the electorate has had to hold the private companies to account through the only means possible, direct and court action. This level of resistance is growing in strength and effectiveness. Nonetheless, it is difficult to say whether it will reverse the overwhelming social and economic damage done by the tempestuous transition to private sector-led economy in South Africa. « Previous: CounterSpin Why is the press unable to report protests accurately? Thanks for this excellent piece Adam, it gives a very concise summary to South Africa’s failure today. I’m citing your article for my documentary-film which addresses some of these issues.